Hallo sobat Info Bursa Lowongan Kerja Indonesia Terbaru Terpercaya 2019, di Postingan ini yang berjudul Lowongan Kerja Programmer PT Emerio Indonesia 2018, kami telah mempersiapkan artikel serta materi ini dengan baik dan ringkas agar mudah di pahami untuk anda baca dan dapat di ambil informasi didalamnya oleh temen-temen semuanya. Artikel ini dapat dicari melalui tema Bandung, Bekasi, Bogor, Jakarta, Karawang, Loker Daerah Papua Barat, Loker Daerah Riau, Loker Daerah Sulawesi Barat, Loker Daerah Sulawesi Selatan, s1, s2, s3, Surabaya, swasta, umum, yang kami tulis ini semoga dapat bermanfaat dan memudahkan temen-temen untuk mendapatkan pekerjaan yang diinginkan. Baiklah, selamat membaca. We provide a suite of solutions and IT services for Banking, Insurance, Telecommunications, Utilities, Education, Government, Hospitality and Social Services verticals. We have been consistently delivering high quality services with our in-country and right-shored teams of domain and technology experts for the last 20 years. 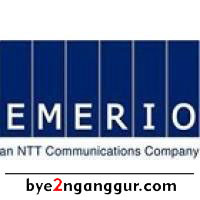 Combining NTT Communications’ world-class capabilities in networks, data centers, hosting, cloud, and managed security services with Emerio’s process and technology expertise in IT applications, IT Infrastructure and Consulting Services, we offer comprehensive, tailor-made, scalable and secure solutions to our clients. A fully owned subsidiary of NTT Communications which is part of NTT Group, a US$105 billion Group. NTT Group is one of the world’s largest companies in data hosting, connecting more than 230 centres worldwide. Its’ wholly owned marine fibre-optic cable network makes up the world’s second largest IP backbone. NTT Group’s global network is supported by offices in every major geographic region, delivering service, support and technical expertise to you. Candidate must possess at least Diploma, Bachelor's Degree in Engineering (Computer/Telecommunication), Computer Science/Information Technology or equivalent. 3+ years’ software development experience. Advanced knowledge of Windows operating systems. HTML and CSS experience preferred. Sekianlah artikel Lowongan Kerja Programmer PT Emerio Indonesia 2018 kali ini, mudah-mudahan bisa memberi manfaat untuk anda semua. Sampai bertemu kembali di postingan artikel lainnya. Anda sekarang sedang membaca artikel Lowongan Kerja Programmer PT Emerio Indonesia 2018 Ingat selalu untuk memperhatikan tanggal berakhirnya lowongan. Dan juga selalu waspada terhadap penipuan-penipuan yang berkedok lowongan pekerjaan. 0 Response to "Lowongan Kerja Programmer PT Emerio Indonesia 2018"